Properly store pesticides to prevent hazards that can be potentially harmful to human health and the environment with a pesticide storage unit. Learn with US Chemical Storage safety regulations on how to maintain and properly store pesticides. According the The University of Georgia, College of Agriculture and Environmental Sciences, “Groundwater contamination and exposure to toxic pesticides occur by unsafe storage practices, large accidental spills, unrecoverable spillage of small amounts of pesticides when mixing and loading, leaking equipment, inadequate cleaning of spray equipment, improper disposal of spray solutions, and improper disposal of containers and other waste materials”. Do not store incompatible materials near pesticides. Store flammable liquids in a proper fire-rated storage unit or designated distances with a non-fire rated unit. Always use the original container to store pesticides – do not transfer pesticides to contaminated containers. Do not stack pesticide storage. Follow directions on pesticide storage labels. Keep pesticide inventory in a well-ventilated and dry pesticide storage unit. Keep pesticide storage units on an elevated area to avoid flooding. Keep your storage unit locked and secure. Avoid storing pesticides near an ignitable source. Containers storing pesticides must be tightly sealed at all times. While this document may cover a number of important compliant pesticide storage solutions, it cannot address every single situation for keeping pesticide storage maintained and compliant. Consult your state or local agencies and your pesticide’s MSDS for more information on safe pesticide storage practices. 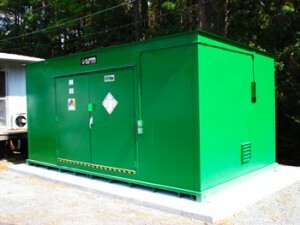 Pesticide Storage Units by US Chemical Storage – Safe, Secure, Compliant. Pesticide storage units by US Chemical Storage offer safety, security and 100% compliance. Pesticide storage units are designed to keep your pesticide inventory compliant and maintained. These pesticide storage units are 100% customizable and can be designed to meet your exact specifications. Constructed from heavy-gauge steel for superior strength and dependability. Featured with a leak-proof secondary sump containment to contain chemical spills, leaks or accidents. All pesticide storage units come with a 15-year structural warranty and a chemical and weather resistant epoxy top-coat for protection against extreme weather conditions. Compliantly store pesticides to remain safe from ground water contamination and potential hazards to human health with a pesticide storage unit by US Chemical Storage.